The Special Testing and Research Laboratory’s Emerging Trends Program compiled the data for this report through a query of archived seizure and analysis information from drug evidence analyzed by the Drug Enforcement Administration’s laboratory system. This data is representative of drug evidence seized and analyzed in the date ranges annotated. This is not a comprehensive list of all new psychoactive substances and is not representative of all evidence analyzed by DEA. 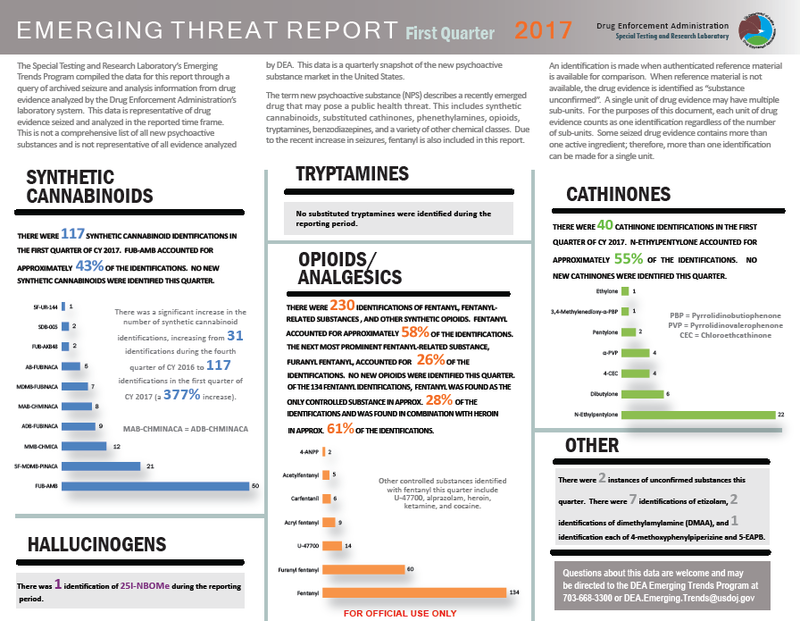 This data is a quarterly snapshot of the new psychoactive substance market in the United States. The term new psychoactive substance (NPS) describes a recently emerged drug that may pose a public health threat. This includes synthetic cannabinoids, substituted cathinones, phenethylamines, opioids, tryptamines, benzodiazepines, and a variety of other chemical classes. Due to the recent increase in seizures, fentanyl is also included in this report. An identification is made when authenticated reference material is available for comparison. When reference material is not available, the drug evidence is identified as “substance unconfirmed”. A single unit of drug evidence may have multiple sub-units. For the purposes of this document, each unit of drug evidence counts as one identification regardless of the number of sub-units. Some seized drug evidence contains more than one active ingredient; therefore, more than one identification can be made for a single unit. The following guide was released by the Department of Justice on April 29, 2015. Any Internet-connected organization can fall prey to a disruptive network intrusion or costly cyber attack. A quick, effective response to cyber incidents can prove critical to minimizing the resulting harm and expediting recovery. The best time to plan such a response is now, before an incident occurs. 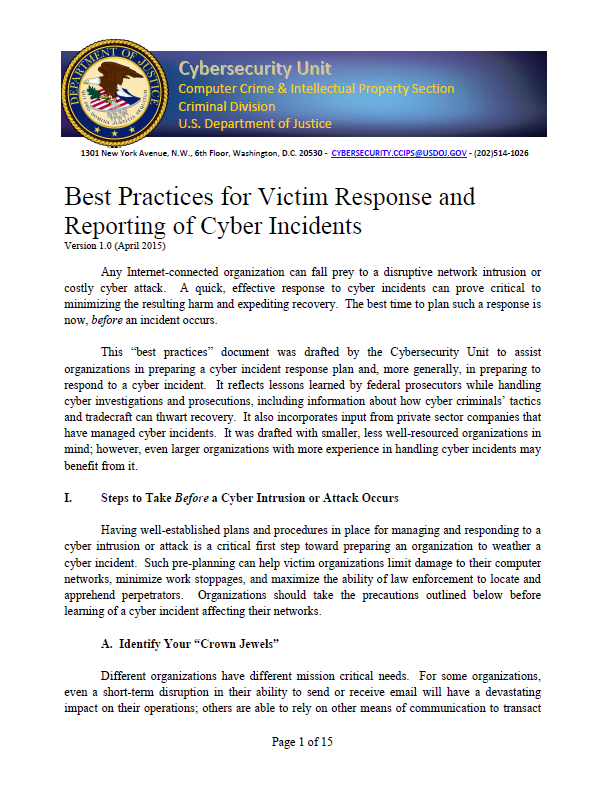 This “best practices” document was drafted by the Cybersecurity Unit to assist organizations in preparing a cyber incident response plan and, more generally, in preparing to respond to a cyber incident. It reflects lessons learned by federal prosecutors while handling cyber investigations and prosecutions, including information about how cyber criminals’ tactics and tradecraft can thwart recovery. It also incorporates input from private sector companies that have managed cyber incidents. It was drafted with smaller, less well-resourced organizations in mind; however, even larger organizations with more experience in handling cyber incidents may benefit from it. Having well-established plans and procedures in place for managing and responding to a cyber intrusion or attack is a critical first step toward preparing an organization to weather a cyber incident. Such pre-planning can help victim organizations limit damage to their computer networks, minimize work stoppages, and maximize the ability of law enforcement to locate and apprehend perpetrators. Organizations should take the precautions outlined below before learning of a cyber incident affecting their networks. Different organizations have different mission critical needs. For some organizations, even a short-term disruption in their ability to send or receive email will have a devastating impact on their operations; others are able to rely on other means of communication to transact business, but they may suffer significant harm if certain intellectual property is stolen. For others still, the ability to guarantee the integrity and security of the data they store and process, such as customer information, is vital to their continued operation. The expense and resources required to protect a whole enterprise may force an organization to prioritize its efforts and may shape its incident response planning. Before formulating a cyber incident response plan, an organization should first determine which of their data, assets, and services warrants the most protection. Ensuring that protection of an organization’s “crown jewels” is appropriately prioritized is an important first step to preventing a cyber intrusion or attack from causing catastrophic harm. The Cybersecurity Framework produced by the National Institute of Standards and Technology (NIST) provides excellent 1guidance on risk management planning and policies and merits consideration. Procedures for notifying law enforcement and/or computer incident-reporting organization. All personnel who have computer security responsibilities should have access to and familiarity with the plan, particularly anyone who will play a role in making technical, operational, or managerial decisions during an incident. It is important for an organization to institute rules that will ensure its personnel have and maintain familiarity with its incident response plan. For instance, the procedures for responding to a cyber incident under an incident response plan can be integrated into regular personnel training. The plan may also be ingrained through regularly conducted exercises to ensure that it is up-to-date. Such exercises should be designed to verify that necessary lines of communication exist, that decision-making roles and responsibilities are well understood, and that any technology that may be needed during an actual incident is available and likely to be effective. Deficiencies and gaps identified during an exercise should be noted for speedy resolution. Incident response plans may differ depending upon an organization’s size, structure, and nature of its business. Similarly, decision-making under a particular incident response plan may differ depending upon the nature of a cyber incident. In any event, institutionalized familiarity with the organization’s framework for addressing a cyber incident will expedite response time and save critical minutes during an incident. An organization can fall victim to a cyber intrusion or attack even after taking reasonable precautions. Consequently, having a vetted, actionable cyber incident response plan is critical. A robust incident response plan does more than provide procedures for handling an incident; it also provides guidance on how a victim organization can continue to operate while managing an incident and how to work with law enforcement and/or incident response firms as an 4investigation is conducted. An organization’s incident response plan should, at a minimum, give serious consideration to all of the steps outlined below. Any communications (in particular, threats or extortionate demands) received by the organization that might relate to the incident should also be preserved. Suspicious calls, emails, or other requests for information should be treated as part of the incident. Evidence that an intrusion or other criminal incident has occurred will typically include logging or file creation data indicating that someone improperly accessed, created, modified, deleted, or copied files or logs; changed system settings; or added or altered user accounts or permissions. In addition, an intruder may have stored “hacker tools” or data from another 5intrusion on your network. In the case of a root-level intrusion, victims should be alert for signs that the intruder gained access to multiple areas of the network. The victim organization should take care to ensure that its actions do not unintentionally or unnecessarily modify stored data in a way that could hinder incident response or subsequent criminal investigation. In particular, potentially relevant files should not be deleted; if at all possible, avoid modifying data or at least keep track of how and when information was modified. The following report on the FBI’s use of national security letters (NSL) from 2007-2009 was released in August by the Department of Justice. This review is a follow-up to three previous OIG reports concerning the FBI’s use of national security letter authorities. 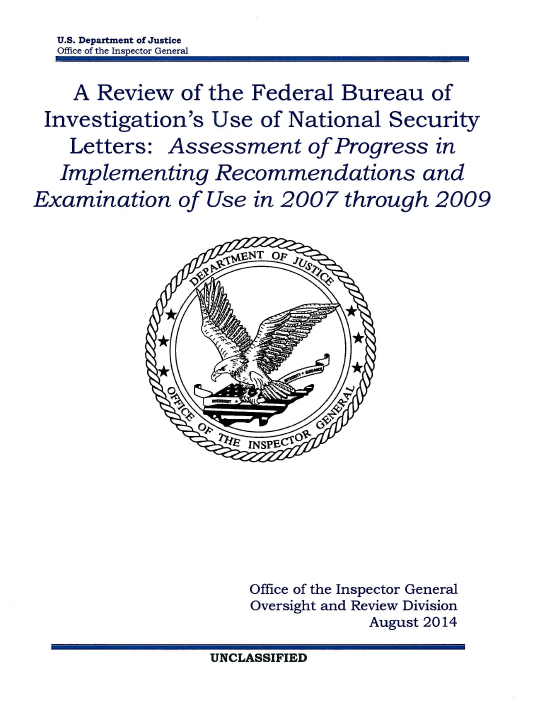 In our first and second NSL reports, issued in March 2007 and March 2008, the OIG found repeated instances of the FBI’s misuse of NSL authorities during 2003 through 2006. During our first NSL review we also discovered the FBI’s practice of issuing exigent letters and using other informal methods to obtain telephone records, instead of using NSLs or other legal process. We addressed these practices in a separate report issued in January 2010. In this follow-up review, the OIG examined three topic areas. First, we assessed the current status of the FBI and the Department’s implementation of the recommendations made in our prior NSL reports, which covered the FBI’s use of NSLs during calendar years 2003 through 2006. Second, we examined the FBI’s use of NSLs during calendar years 2007, 2008, and 2009. This examination included an assessment of whether corrective measures taken by the FBI and the Department in response to the findings and recommendations of our first and second NSL reports resulted in improved compliance with NSL requirements. Third, we examined the current status of the FBI and the Department’s efforts to implement the recommendations made in our prior Exigent Letters Report. We concluded that the FBI and the Department have devoted considerable resources toward implementing the recommendations made in our past reports and taking additional measures to improve the FBI’s compliance with NSL requirements. Our review demonstrated that these efforts have resulted in substantial improvement in NSL compliance. We believe that the corrective measures that have had the greatest impact on the FBI’s compliance with NSL authorities are the development and consolidation of NSL policy and guidance in the Comprehensive NSL Guidance EC and later the DIOG; the mandatory training provided to NSL users and approvers; the implementation of the NSL subsystem; and the periodic inspections of NSL use by the FBI Inspection Division and the national security review teams. We determined that the FBI and the Department have fully implemented 23 of 28 recommendations from our first and second NSL reports by creating new internal controls, providing guidance and training to FBI personnel, establishing new record-keeping practices, and conducting periodic reviews of NSL usage. Nevertheless, five recommendations from our first and second NSL reports require additional effort and attention from the FBI to address the accuracy of information entered into the NSL subsystem and the FBI’s record-keeping practices. We will consider whether to close these recommendations after the FBI provides additional information or takes the additional steps described in more detail in Chapter Two. Our review found that during 2007 through 2009 the FBI issued significantly fewer NSL requests than during 2003 through 2006. 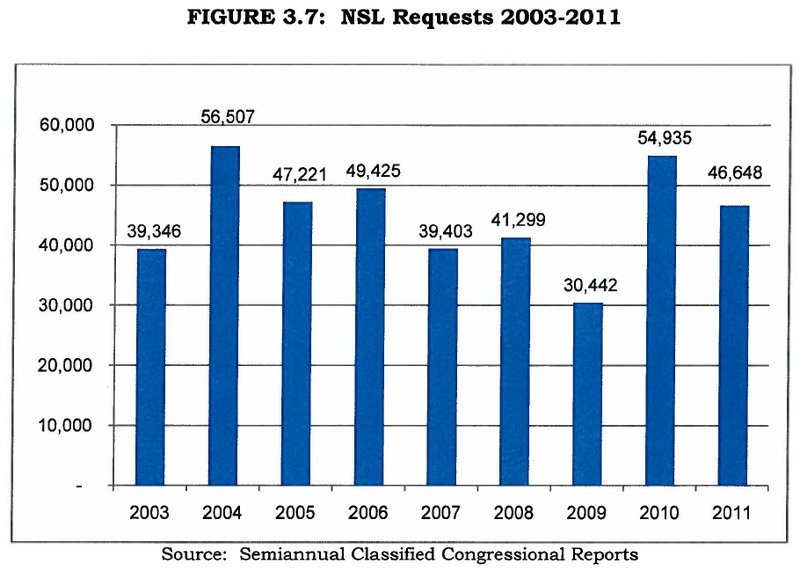 During 2007 through 2009, the FBI issued 111,144 NSL requests, with an annual average of 37,048. 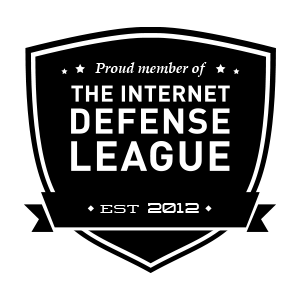 By comparison, the FBI issued approximately 51,051 NSLs per year between 2004 and 2006, and approximately 48,125 NSL requests per year between 2003 and 2006. The factors that may have contributed to the decrease in the FBI’s NSL use during 2007 through 2009 are not self-evident from the data we reviewed, though a few people at the FBI told us that because of increased scrutiny on NSL use agents employed alternative investigative tools when possible. The Department’s most recent semiannual classified reports to Congress indicate that the FBI’s use of NSLs returned to historically typical numbers after 2009. We found that the vast majority of NSL requests issued during 2007 through 2009 sought telephone and electronic records under the ECPA. We also found that the FBI issued a majority of its NSL requests in furtherance of counterterrorism investigations and a significant number in furtherance of counterintelligence investigations. The FBI issued substantially fewer requests in furtherance of foreign computer intrusion cyber investigations. Well more than half of the FBI’s NSL requests in 2007 through 2009 were generated from investigations of U.S. persons: 12,818, or 64 percent, in 2007; 18,447, or 74 percent, in 2008; and 13,515, or 63 percent, in 2009. This data indicates that the shift reported in our second NSL review toward more NSL requests generated from investigations of U.S. persons as compared to non-U.S. persons- from 39 percent in 2003 to 57 percent in 2006- continued in 2007 through 2009.
he following special report was released May 7, 2013 by the Department of Justice Bureau of Justice Statistics. In 2011, a total of 478,400 fatal and nonfatal violent crimes were committed with a firearm. Homicides made up about 2% of all firearm-related crimes. There were 11,101 firearm homicides in 2011, down by 39% from a high of 18,253 in 1993. The majority of the decline in firearm-related homicides occurred between 1993 and 1998. Since 1999, the number of firearm homicides increased from 10,828 to 12,791 in 2006 before declining to 11,101 in 2011. Nonfatal firearm-related violent victimizations against persons age 12 or older declined 70%, from 1.5 million in 1993 to 456,500 in 2004. The number then fluctuated between about 400,000 to 600,000 through 2011. While the number of firearm crimes declined over time, the percentage of all violence that involved a firearm did not change substantively, fluctuating between 6% and 9% over the same period. In 1993, 9% of all violence was committed with a firearm, compared to 8% in 2011. The primary source of information on firearm-related homicides was obtained from mortality data based on death certificates in the National Vital Statistics System of the National Center for Health Statistics (NCHS), Centers for Disease Control and Prevention’s (CDC) Web-based Injury Statistics Query and Reporting System (WISQARS). These mortality data include causes of death reported by attending physicians, medical examiners, and coroners, and demographic information about decedents reported by funeral directors who obtain that information from family members and other informants. The NCHS collects, compiles, verifies, and prepares these data for release to the public. The estimates of nonfatal violent victimization are based on data from the Bureau of Justice Statistics’ (BJS) National Crime Victimization Survey (NCVS), which collects information on nonfatal crimes against persons age 12 or older reported and not reported to the police from a nationally representative sample of U.S. households. Homicide rates are presented per 100,000 persons and the nonfatal victimization rates are presented per 1,000 persons age 12 or older. Additional information on firearm violence in this report comes from the School-Associated Violent Deaths Surveillance Study (SAVD), the FBI’s Supplemental Homicide Reports (SHR), the Survey of Inmates in State Correctional Facilities (SISCF), and the Survey of Inmates in Federal Correctional Facilities (SIFCF). Each source provides different information about victims and incident characteristics. Estimates are shown for different years based on data availability and measures of reliability.